After a nice aquascaping tour in Portugal it was time to go back the UK for another run of events. 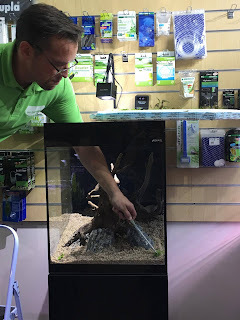 The UK aquascaping scene as actually been teeming up with amazing events in the last month, which show's how much the hobby is spreading around here. 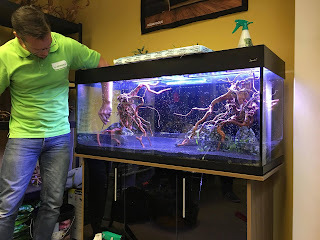 We had the Aqua depot showroom opening event, George Farmer aquascaping a blackwater aquarium at Fishcove's aquatics and at crowders aquatics. We also have some great events coming up on the horizon, but the biggest one is the live scape off between George Farmer and The King of DIY Joey Mullen on his first visit to the UK. That's the one any aquarium enthusiast will not want to lose. Today's blog however is about the aquascaping event I attended a couple of weeks ago at Crowder's aquatics with George. Crowder's aquatics is a Family run business located in Bordon in the southern coast or England. Its about 45 minutes drive from London. 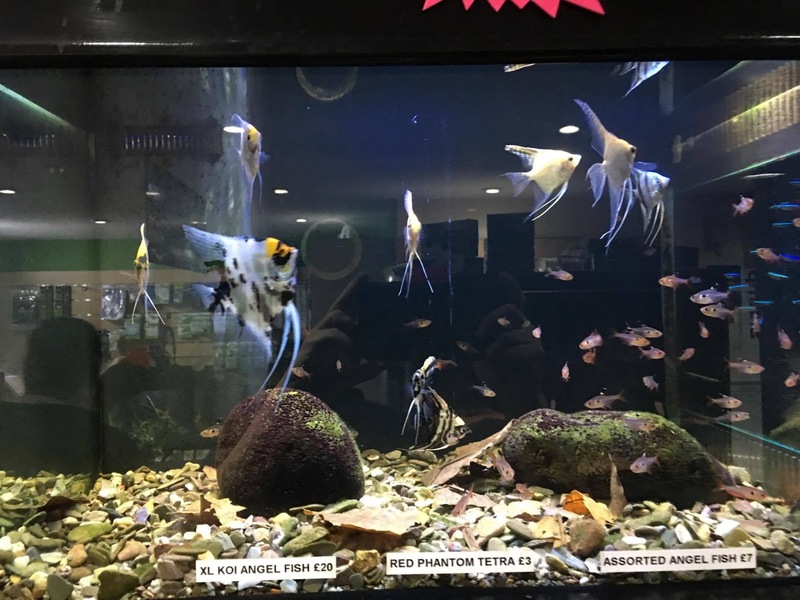 The shop is run by Rocky and Kaz Crowder, a couple that shares a passion for fishkeeping and aquascaping. Once again me and my wife took a day off to attend the event and get to know another shop, and this one didn't disappoint. 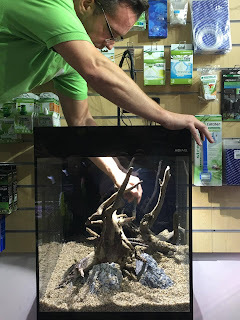 To explain Crowder's aquatics I have to give a bit of insight into to it's history, during the event both Kaz and Rocky were extremely friendly and told us about their journey as shop owners. There is another blog that interviewed them in the past about this, so I will give a bit of hindsight without delving too deep, instead this article will focus more on the event. 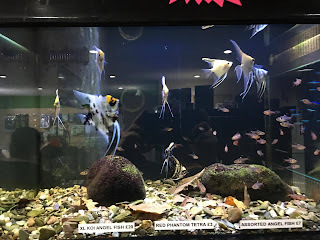 You can find a lot more information about the history of Crowder's aquatics in this blog post from lothians fishkeepers. Kaz and Rocky started their business about two and a half years ago, they have both been passionate hobbyists for 17 years running multiple setups at home. Going into business wasn't something they planned, however when they bought a shop system to expand their hobby at home, that lead them to think that they could actually start their own business. So around two and a half years ago Crowders aquatics was born, however it was not located where it is today. They realized how expensive it would be to setup the shop, so initially they ran the business from home. Rocky did say that actually didn't go well with some of their competitors who believed they were building a shed business trying to undercut them, this however is not true. 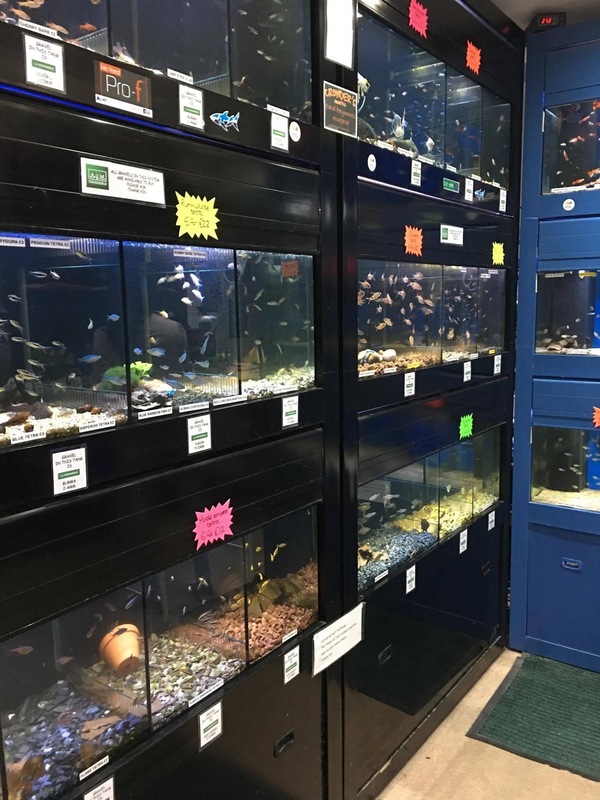 They went to all the troubles to get all the licenses required going as far a doing changes to their house to be able to aquire it, the house was licensed as a fully fledged aquatic retailer. He is very proud to say progress was slow, but they did it all in their own money, no credit. And this takes me back to my visit in Portugal to Aquaeden, that's two business owners now in two different countries that tell me that part of their success was going small and growing slow while at the same time being free of debt repayments to hinder their business. A lesson that anyone planning to setup up their own aquarium business should consider. So after a some time working from home they eventually decided to move where they are now. But the shop was a lot smaller, they only had one of the units, today they have three. I was really surprised by Crowder's, even before I made it through the front door. I was expecting a traditional style fishkeeping shop, I actually found something different. 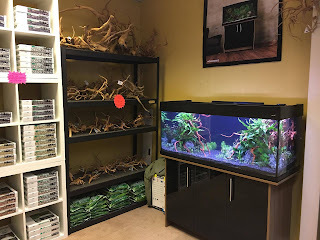 I think they are a traditional fishkeeping style shop, in a sense that when it comes to fish their setups all look flawless, its undeniable that they started the hobby as fishkeepers. 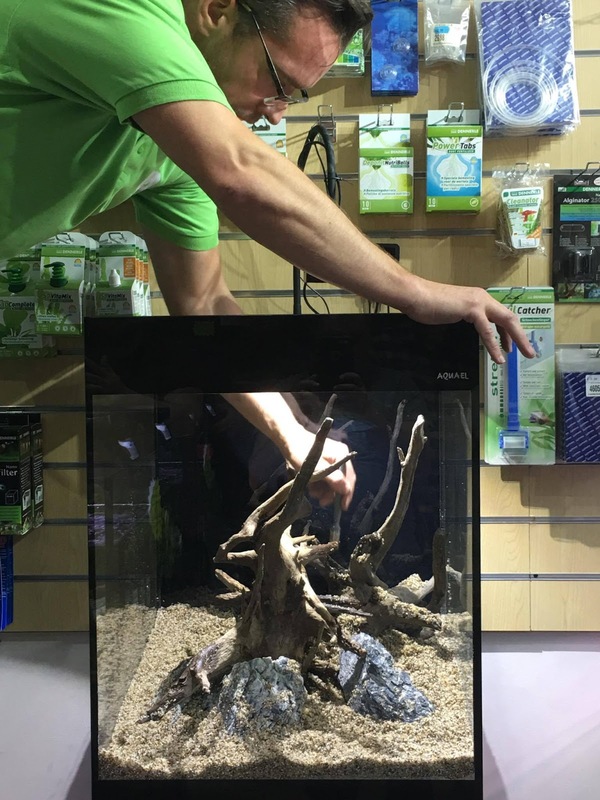 However as they also fell in love with aquascaping, as the shop grew they put a great effort in making it reference for aquascapers. 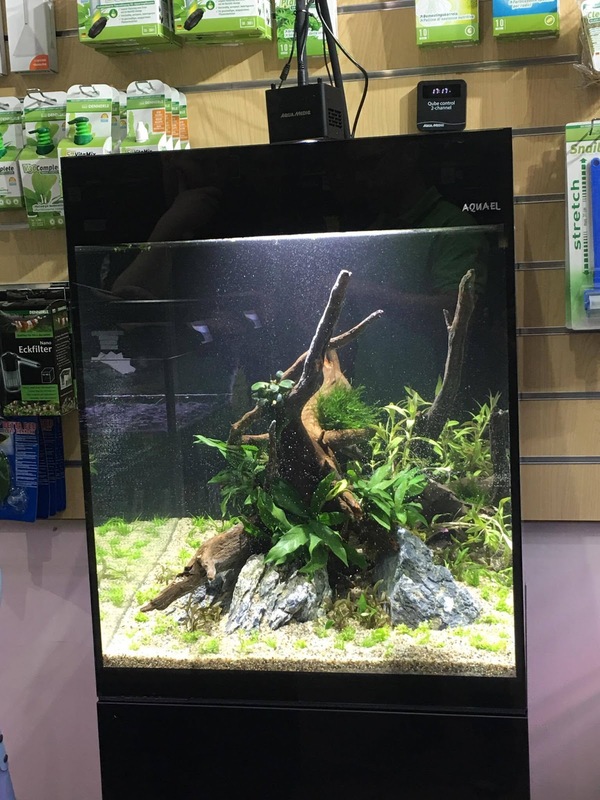 So out of the three units the shop holds today, one of them is totally dedicated to aquascaping. The scape room as Rocky called it, even has a name sign on top of the door, is a little aquascaping treasure chest, inside you find the aquaone aquarium that George was scaping in this event, but more importantly a large collection of hardscape materials. I have not seen a larger one in the UK so far. They are very proud of it and they both explain the effort and to what lengths they had to go to acquire it. 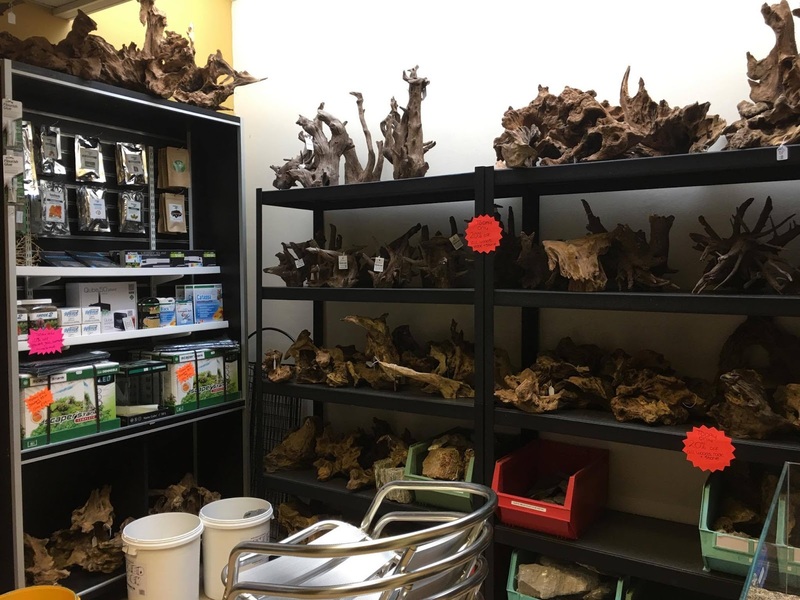 If you love aquascaping you owe it to yourself to visit Crowder's, you'll find a wide and large selection of wood, rocks and substrates. Every piece nicely placed and organized in the shelves just awaiting to be picked up. In the scape room they also have a practice tank, Kaz proudly told us that the tank in question was offered to them by the manufacturer. 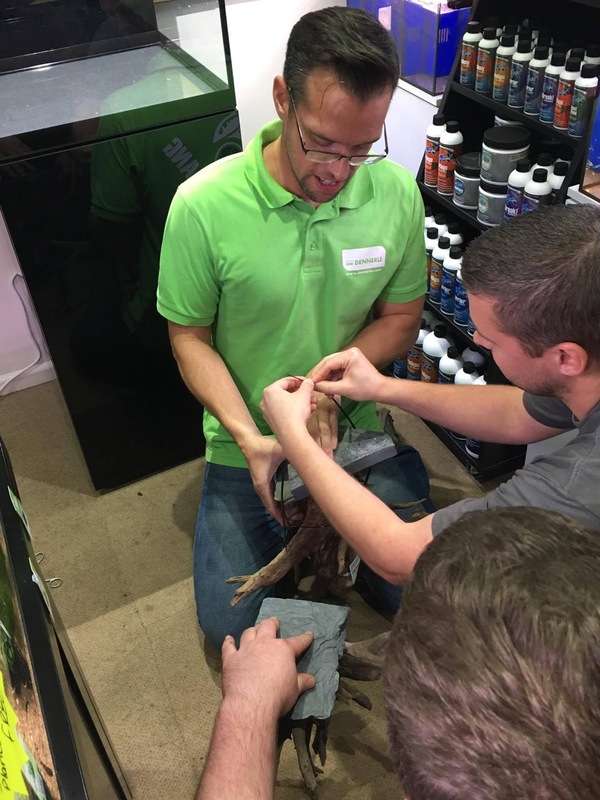 The one they have was used at UKAPS aquascaping experience last year, and was one of the tanks scaped in the hardscape contest. It was also one of the manufacturers prototypes for their aquarium line. So when you visit Crowder's you can not only find a large selection of hardscape, you can entertain yourself in this practice tank to make sure you get the pieces required to build your layout at home. When you come out of the Scape room you have a second smaller unit that sells all types of aquarium related equipment, the blue gravel and few fake decorations stand out as eye sore in contrast with the amazing scape room. But during the day Rocky explained that while its not his cup of tea, there are costumers that look for it, and if he stops stocking it, they'll just take the business somewhere else. I can't fault that reasoning, we all like our aquascaping shops, but in the end it is a business, and it needs to supply products that suit their costumers needs. Besides it made sense when he added, that by selling it he can overtime try to explain to these costumers the benefits of keeping natural materials and plants in the aquarium, he was happy to say that overtime he had converted quite a few costumers to aquascaping. 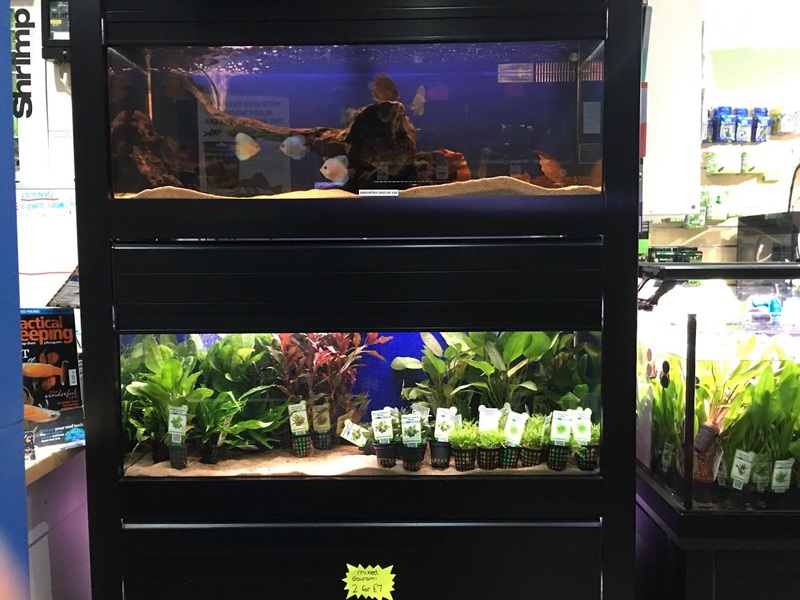 This to me makes sense, if he alienates these costumers they will most likely go to other shops that have no interest in trying to spread the passion of aquascaping and nature aquarium to their costumers. 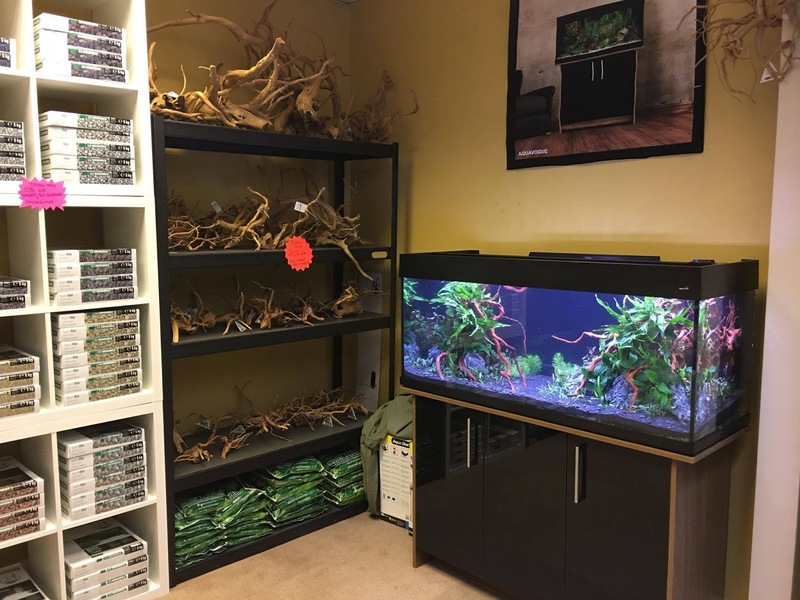 The final unit of the shop is the original Crowders, here you'll find the fishkeeping setups, one thing that left me amazed is that unlike most shops were the fish holding tanks look rather bland, most with just water and sand or gravel. At Crowders they feel to some degree like they were scape, different types of gravels where used in each of them, Kaz later told me it was their idea of showing of the different types to their costumers. Also a few rocks in some of the tanks, and leaves that release tannins giving it a blackwater biotope feel. I fell in love with these and they stand as an example for other aquarium shops. In this area we also have the plants, a large tank, with dividers in the center holds a large amount of plants, plus another one on the side has even more plants. The selection is wide and of great quality. 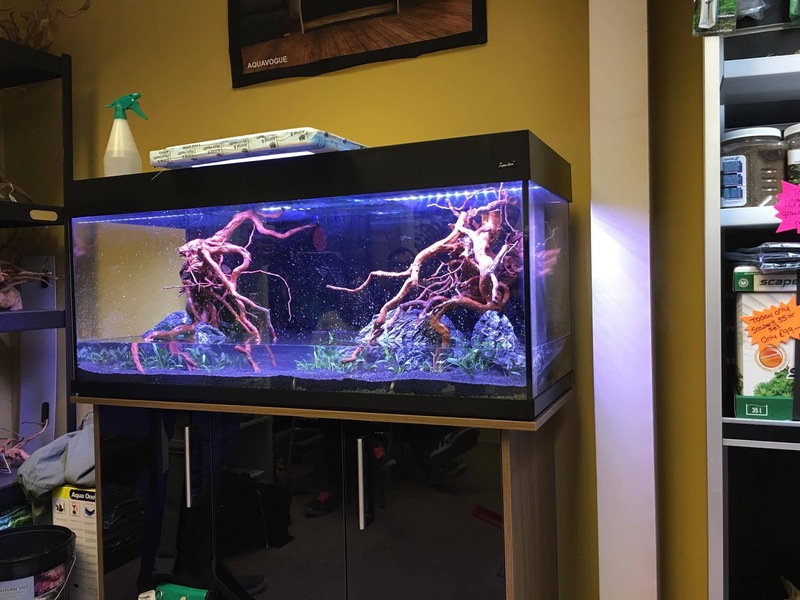 Here you can also find an Aquael cube tank, this was to be George Farmers second scape of the day. And finally on the corner there was a blackwater style aquascape in a Dennerle scapers tank. 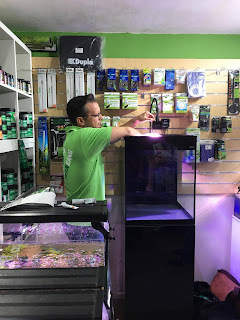 Before George arrived I did my tour of the shop and had a lovely conversation with Caz, I also took the chance to purchase my aquascaper fertilizer. For this event the shop was giving discounts on many of their products and I was really looking to try the aquascaper range. George arrived and things started being prepared for the event, there were about 10 to 15 people in attendance, which wasn't easy, because there was not a lot of space available. The first tank to be scaped was an Aquaone Aquavogue 245, the tank is 120 cm (L) x 50 cm (H) x 45 cm (D), its has the plastic frames and lid with built in LED lighting. 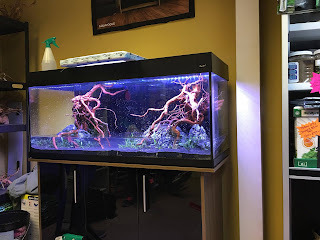 This was to be assembled as a Low light, no co2 aquarim, so the plants chosen were easy undemanding plants. Before starting the even George asked questions to the audience, about if they had any experience with aquascaping and he also gave a bit of detail into his adventures aquascaping across the world. 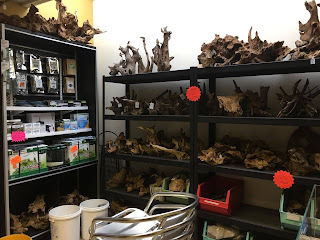 Then the scaping process started, the first step was the substrate, in this scape instead of going for a complete type of substrate, a product called miracle mud was used, George acknowledged knowing about it, but never using it before. 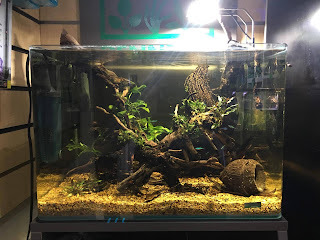 This was then capped with unipac black sand, this is a sand that I have used extensively in the past, it looks dark black once the tank is full, in the end its just sand, but its a good looking one for those looking for something different. After the substrate was in place it was time for the hardscape. To start was the wood, for this George used pre-soaked redmoor wood, he started explaining how to position wood in natural ways, and explaining the nature aquarium philosophy, to highlight how wood should be positioned he actually placed it originally in a very unnatural way, this was to show that if it did not look natural, then I didn't work. 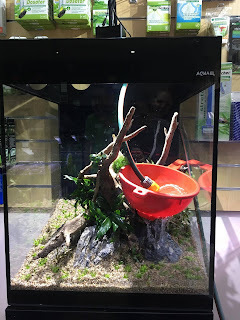 He placed it hanging upside down in the centre of the aquarium, and as a nature aquarium it looked horrible, however to me it looked like something you would expect in a biotope. I told George it actually looked like roots dipping into the water, this actually gave him an idea. He started positioning the roots dipping down into the bottom, but instead of doing it centrally, he did it from the sides, he used multiple pieces to create the hardscape while explaining the audience how and why he was doing it, in the end we had the wood flowing down very naturally from the sides into the centre with a sort of pathway in the middle. George then placed the rocks, for this scape he used seiryu stones, he explained about trying to use rocks that look not only beautiful but that share the same strata, this serves to give a sense of flow into the rock work and make the composition look natural. As example he used different pieces of rock, to highlight the good ones from the bad. While placing the rocks he was also very careful to place them weighing down the roots, he gave an example of a previous scape, where the wood had not been soaked properly and it lifted up and ruined the scape, so he emphasized the importance of soaking the wood properly and using stones as a extra layer of safety to keep it in place. He started by placing the two cryptocorynes in the front, mixing them in together to create a more wild and natural looks. He explained the properties of both plants as well as the famous cryptocoryne melt, which is a property that cryptocorynes have in which they melt if a sudden change in water conditions happen. One should not be worried about it as the plant is not dead and it will soon recover and grow again. 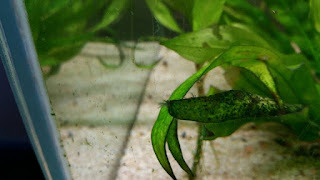 After he placed both Java Ferns and Anubias, these were attached in the woods, just by wedging them in, the anubias were purposely placed in the shade of the crytocoryne to avoid them being covered in algae. 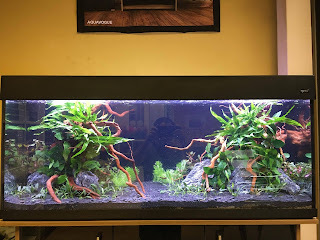 The next plant was ludwigia super red, this plant is an easy to keep plant that has the trait of growing red, actually George explain it's the the easiest plant to do this in low-light conditions. As normally for plants to go red high-lighting is needed. This was placed in the back and next to the glass. Finally he used Pogostemon Erectus in the centre to enhance the pathway, he was not 100% sure if this plant was gonna grow well in a low-light environment, but he was willing to try, explaining that if it didn't work then it would be replaced for something easier. 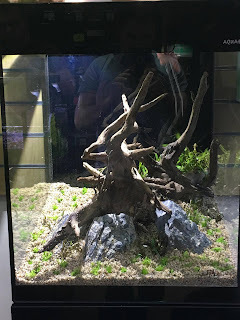 This is something that is natural in aquascaping, the layout evolves overtime and sometimes plants have to be changed to accommodate this or because they are simply not growing well. 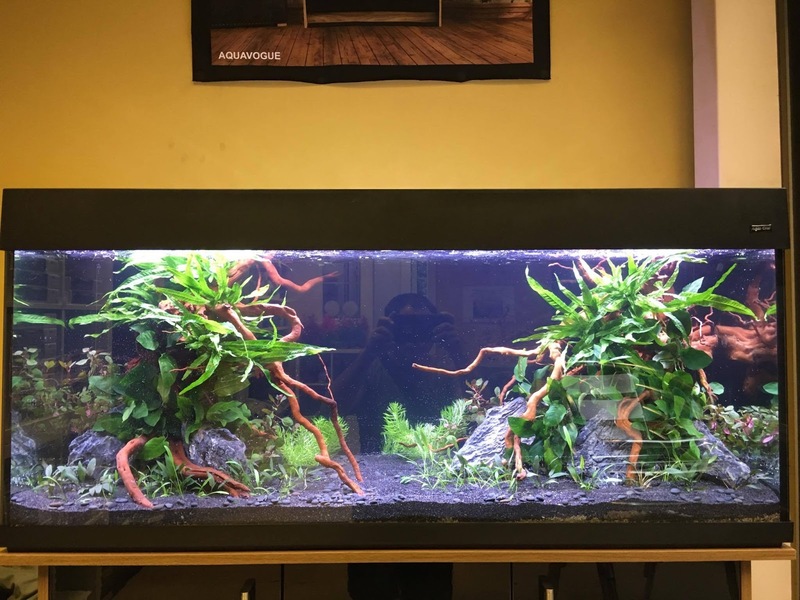 During this time I actually had a chance to help out preparing some of the plants, so I did end up giving a hand in creating this aquascape. After planting it was time for the the star of the show to do its thing. The worldwide famous George Farmer red colander took center stage to help fill in the tank without disturbing the substrate and plants. For those wandering, the colander is used to fill in the tank dispersing the water gently which avoids damaging the scape. After filled we ended up with a lovely U-shape easy to keep low-Energy, no co2 aquascape. After this a break was announced for refreshments, food was provided for those in attendance. I had a very nice friendly chat with Rocky which gave me a better insight into the shops history and background. After that it was time for George’s second aquascape of the day. This time it was an high-tech aquael cube aquarium. Now I have an aquael plant leddy light unit and I am very happy with it, it's a nice piece of kit at a very small price. However this cube and cabinet look amazing and it's not what I would call cheap tech, quality wise atleast. The light unit however was an aquamedic which felt very similar to the kessils Tuna suns. Light output of these seemed pretty good and I found out that they are relatively cheaper. 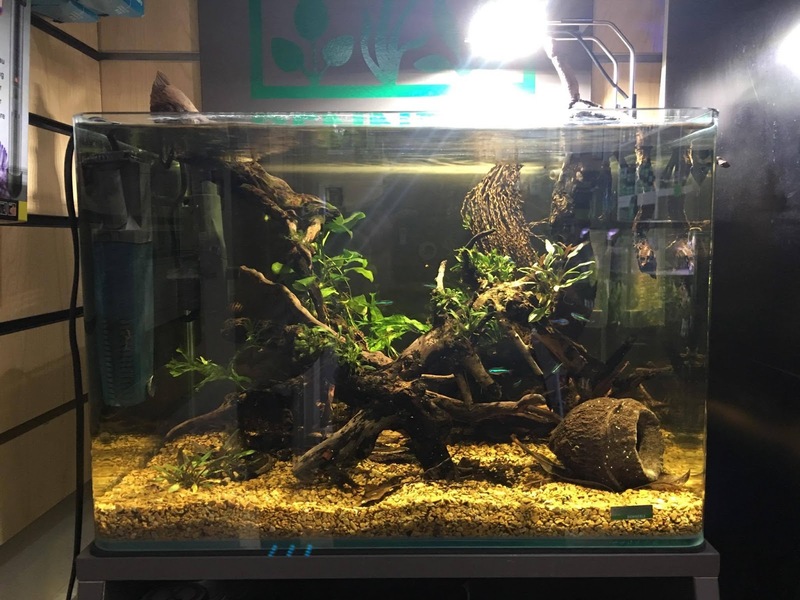 For this scape George went with an island shaped design and he chose to use some specially detailed type of wood that he fancied from the shelves. But because it had not been soaked, arrangements had to be made to make sure it would not float up, trying superglue was unsuccessful so the team went with cable ties to secure it to pieces of slate. The cable ties were then hidden by plants where needed. The substrate George used was a mix of dennerle 3 in 1 and 6 in one. I have never used this but it had some interesting colour and texture. It looks like a sand mix by it's actually plant substrate. After that some seiryu stones were added around the wood to add more details into the hardscape. Plant wise this scape used micranthemum Monte Carlo to form a carpet around the island shaped hardscape. It is one of the easiest carpet plants to keep, it's becoming very well known because of the very similar look to hemianthus cuba. As the texture is similar and the only difference is that Monte Carlo is slight larger and much easier to keep. 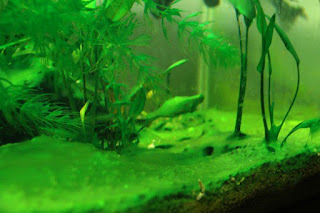 After that java fern,Anubias and some Möss were attached in to the wood. Last but not the least limnophila aquatica was added at the back and the tank was filled. This was a faster assembly as the tank was much smaller. ways worked his art while at the same time educating the audience which I think it's something really important in bringing in more people into the hobby. 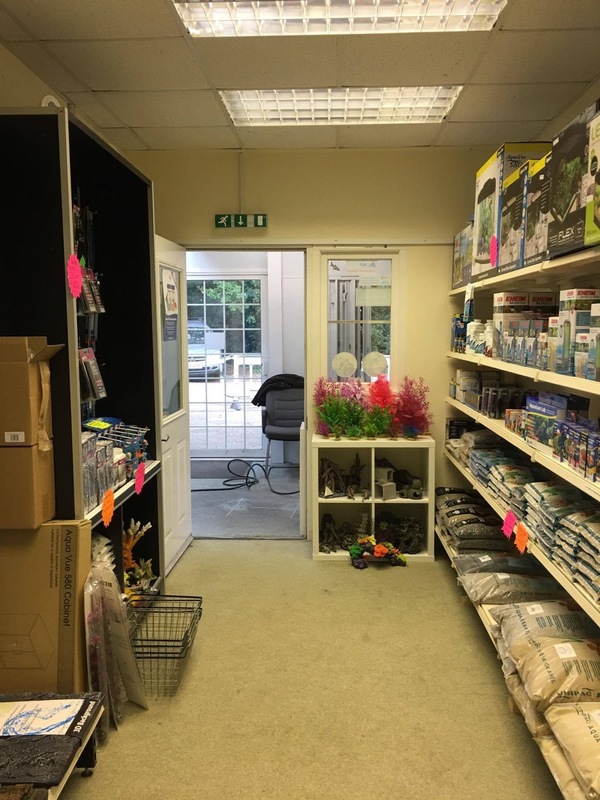 I also got to see a family shop that is working its way into becoming successful and i know Rocky and Caz are on the lookout for a larger space, so I can only imagine how great it will be to see them run a larger shop. The endless possibilities for them to expand and build on the success that they already have. After all it's these smaller shops that will make the hobby grow, I have nothing against the large chain stores, but I will always root for the hobby enthusiast that likes to have a go at running a business. So if you are in the area I really advise you to pop up at crowders aquatics, you won't be disappointed. You can also check their YouTube channel here.